While slightly off-topic for this thread, I thought I'd mention that I've added a link to the LSP home page for the LSP Kit Database. Its location is a bit buried, and not easy to find if you don't already know where it is. Hopefully this will allow everyone to check it out a little more easily. Why is it off topic? It's a good idea. This database is starting to look very comprehensive. Good work Kev. I've got a few more vacs to document and then that's it for my collection. I was lucky enough to find a few rarer kits in a friends collection which I photographed and uploaded. It certainly does! Usually one of the top 5 hits, if it's there at all. In fact, I've been a bit stymied by that fact during some of my kit research - imagine discovering that the only explicit mention of a certain kit is found in the Kit Database! Ah well, as you say Keith, it's getting more comprehensive all the time. The 'related kits' feature works quite well I think. What does one do with vacuform kits. There are never any boxes (well, hardly ever) and the plans are way to big to copy. So what does one do for the database? OK, time for the next question! Does the Revell F-5 series of kits have anything to do with Hasegawa's? In other words, are the Revell kits reboxings of the Hasegawa kits? All three kits are presented in the data list with boxtop pictures. Of these three i can definitely state that the Hasegawa and Revell releases are completely the same. Funny thing is that at comparable sprues the Revell issue has the Hasegawa mark on it (the little flag part on the sprue with the name on it) whereas the same sprue layout in the Hasegawa kit doesn't have the name, it does have the "flag" but nothing is engraved in it. Both kits are the shark nose version. Now, the kangnam kit is a bit different, and it "seems" a sometimes crude copy of the Has. version, the parts look the same, but plastic texture is different, parts layout (sprue wise) is different, parts look exactly the same as the other two, but i noticed that detailing (though apparently the same in appearance) isn't as crispy as the afore mentioned kits, might be due to old moulds??? 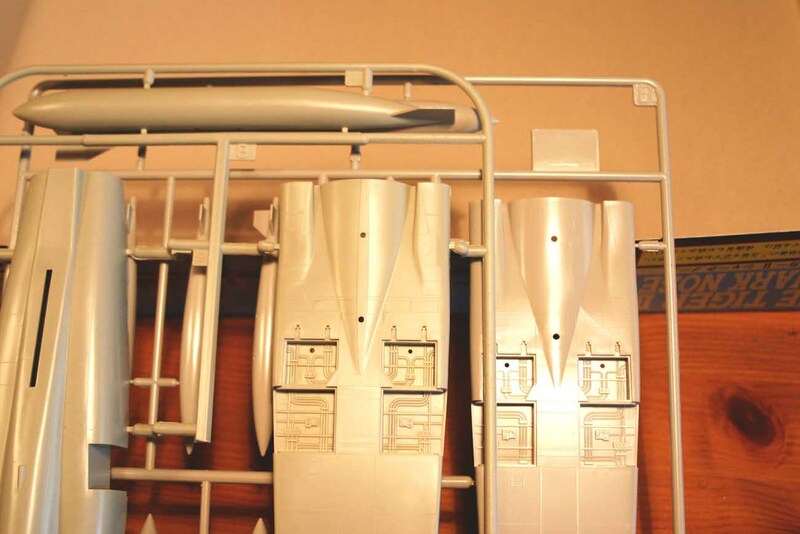 As an example of difference have a look at the picture, which shows two sprues, the left is the Kangnam kit and to the right is the Hasegawa issue. Both show the bottom aft fuselage part, and you might notice a flat and slightly raised part (Kangnam) were the centre line tank would be attached, but on the Hasegawa representation (to the right) it's non existent. Also this kit has a normal nose, but in earlier Has. versions the normal nose was present as well, they even had both types in one kit. So the Kangnam kit is a kind of an enigma as you might say, maybe someone else can shed some light on this. Thanks Jack! I'll put both the Revell and Hasegawa kits down as belonging to the Hasegawa F-5 kit family. Thinking about it, same thing might be the difference between the Revell/Hasegawa/Kangnam F16 releases a couple of years ago. IIRC, the Kangham kit has recessed panel lines, Hasegawa & Revell raised? Otherwise, I believe the Kangham was copied from Hasegawa, not shared molds. Righto, I've pinned this thread now, as I'd like it to be easily found and updated. I haven't had much time in recent months to work on the database, but there's still plenty more work to do! Many thanks to Keith for keeping the fires burning with new kit releases. The Smithsonian Edition P-51D in the black box is an old 70's vintage Revell kit. The Revell Mustang that the gentleman above says has the best shape of any P-51D is actually a repop of the old Monogram Phantom Mustang. That kit is a decent shaped kit. The Revell P-51D in any boxing (I believe the Smithsonian series was the last issue of this kit from the 90's) is terrible IMO. Just looks wrong to me. Even the box photo's make it look bad. Can anyone clarify the state of play here? I think Max is an LSP member, so perhaps he can add something new here too. If what Max says above is indeed true, then I'll add a new kit family for the Revell P-51D series.